nac̓θətəɬp Transformation Plant was created in consultation with elders and key members of the Musqueam Indian Band, Vancouver, Canada, who also bestowed it’s name. nac̓θətəɬp Transformation Plant is a collaboration with nature and community – living earth art. Like all my other wood and stone works such as Tranekaer Vader, 1998 and Zunderschwamm, 1999 nac̓θətəɬp Transformation Plant harnesses the great recycling ability of fungi to facilitate a very long term (30 +/- years) kinetic living earth art work. Musqueam elders advised that the small juvenile tree to be planted right in the middle should be their highly revered tree, the western red cedar. Over the many years, as the fungi breaks down the stacked wood, recycling it into humus, the cedar will flourish into a beautiful tree while the stone slabs (‘petals’) will slowly open up like a flower. In doing these living works, it is one of the artist’s aims to highlight the wonders of fungi. This ancient and generally lesser known plant-like organism is vital to all life on earth, yet is threatened by human activities. Fungi is the supreme terrestrial recycler, the most extensive of all living organisms and is one of our most ancient sources of food and medicine. The uncontrolled build-up of man-made greenhouse gas emissions is making our atmosphere inhospitable ‒ even toxic ‒ to life as we know it. The devastation caused by people is happening around us on an ever-increasing scale. Hopefully, these living earth art works will educate the visitor to be wiser – to become proactive in reversing this spiraling catastrophe. 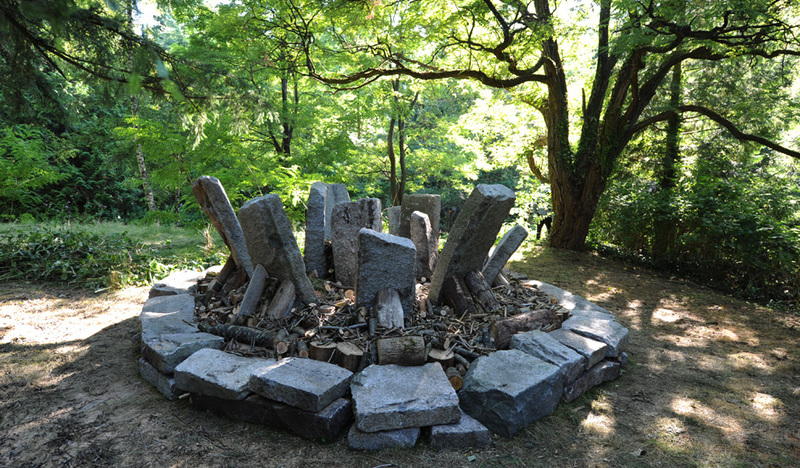 The sculpture was built between the 10th July – 2nd August 2012 at the invitation of VanDusen Botanical Garden Earth Art Exhibition and was curated by John Grande.